COLUMBIA, S.C. — There might have been doubts about how big-game ready the No. 1 seeded, South Region Virginia Cavaliers were for the NCAA Men’s Basketball Tournament after last year’s first-round exit to Maryland-Baltimore County and Friday’s nervous performance in the first half against 16th-seeded Gardner-Webb. But the Cavaliers delivered a huge statement to the rest of the field in Sunday night’s second round with their 63-51 dismantling of No. 9 Oklahoma. This Virginia team is ready for the long haul. Trailing 9-3 and 13-9 early, the Cavaliers exploded for a 14-2 run, using clutch shooting inside and out and their trademark, man-to-man defense to cool off the dangerous Sooners and advance to the Sweet 16. 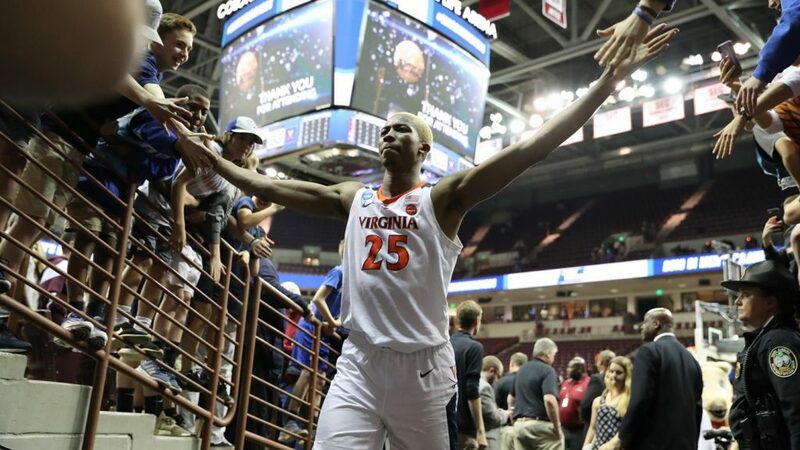 Big man Mamadi Diakite made the most of a rare start with 14 points, nine rebounds and three blocked shots, while guards Ty Jerome and De’Andre Hunter chipped in with 12 and 10 points each to lead Virginia past what had been the troublesome early rounds in recent years. Oklahoma loomed as a sizable challenge after blowing out Mississippi in the first round with its balanced offense, but the Sooners were no match for the smothering defense of Virginia. Brady Manek and Christian James paced the Sooners with 13 points apiece, but the Cavaliers limited Oklahoma’s Kristian Doolittle, the star of Friday’s performance, to eight points on a night where OU shot 36.5% for the game. The biggest key was the extended role of Diakite, the 6-foot-9 junior center from Guinea, who seems to be growing in confidence game-by-game. Diakite was more than up to the challenge. It didn’t take veteran Oklahoma coach Lon Kruger long to realize his team faced an uphill struggle. Up next for Virginia is an encounter on Thursday night against upstart Oregon, the No. 12 seed. But the monkey of under-performing on the big stage seems to be a thing of the past for Virginia. Bennett has tried to even find some humor in Virginia’s historical plight.